Makes it easier to remove stains by not allowing it to set quickly. It extends the time you have to clean up a spill before the carpeting is permanently stained. Your vacuuming will be 50% more effective in removing soil and small particulate matter. 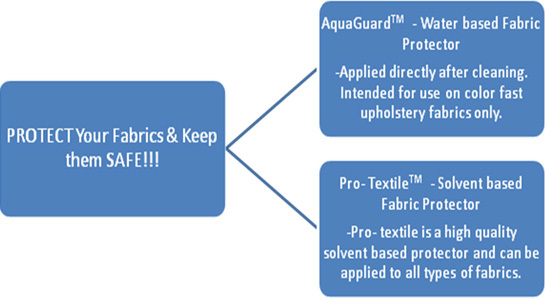 Chem- Dry Fabric Protector provide an invisible barrier, which helps block stains, so that they can be easily removed. The Protector are both water & oil repellent and are designed to protect your fabric from dirt, oil, spills, and stains. Untreated fibers tend to hold these stains and thus produce the familiar dull, dirty appearance. 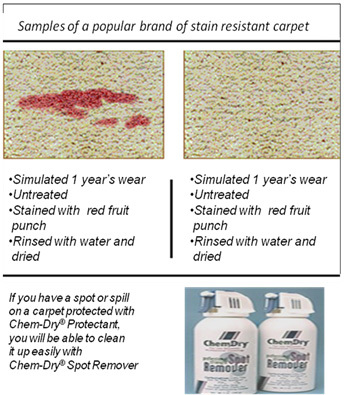 Chem- Dry® has a range of solvent and water- based spotters to remove even the toughest of stains. •Grease, shoe polish, rust, tar, oil, fingernail polish etc. Allergens are substances that trigger allergic reactions such as sneezing, runny nose, itchy eyes, coughing and wheezing. Indoor allergens also play an important role in allergic diseases such as allergic rhinitis and asthma. Instantly neutralizes and renders harmless the harmful Der p1 and Der f1 allergen from dust mite droppings. Is proven in studies by world’s leading experts to be effective in rendering dust mite allergens harmless. © 2010 Super ChemDry. All Rights Reserved.